The last time I was in Super Miss Sue was on their soft opening night, when the tables were turned over to press members and other people of food noteworthiness. It was a cold night in early January and the tall windows that are such a feature of this new restaurant were not much use. Glasses of fizzy prosecco and exquisitely fresh oysters with a wonderful ponzu dressing all went down with ease. It was all very good, but how would Super Miss Sue hold up when dining as a paying visitor? We returned recently for a weekday lunch date. The tall windows along Lower Stephen Street that had looked out onto dreary darkness before were now filled with spring sunshine, lifting the entire room. 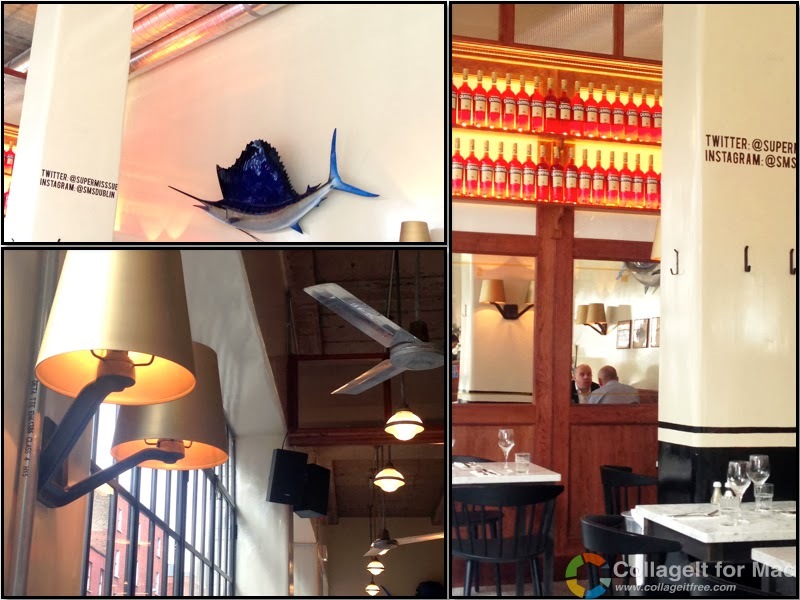 The decor of ceiling fans, wood and brass fittings and backlit Campari bottles reminded me somehow of Spain and the finest tapas bars, altogether fitting for a seafood restaurant. The other end of the venue holds a posh fish'n'chips takeaway, which I've been informed is very good indeed. That, dear reader, will have to be tested another day. There's an extensive menu with a two course lunch option for €25. Interestingly, the set menu is made up of the more higher priced items and I am nearly swayed by the sirloin flap steak with chimichurri and papas fritas. But we stick to our seafood guns. The Bloody Mary seafood cocktail is packed with mussels, clams, prawns and avocado and garnished with a rim of celery salt (regular menu price €14). I can't abide celery, so I leave this dish to Himsef who polishes it off with delight. After all, it's rare that he gets a dish entirely to himself. Instead I dive into pan-seared scallops with sesame and honey truffle ponzu (€13). A little pile of seaweed salad and chargrilled lettuce are wonderful touches to the sweetly seared scallops. It's really really good. Both of us choose grilled fish for mains, although the swordfish burger made a good showing. Himself chose mackerel "straight from the sea" simply grilled with olive oil, lemon and garlic (€12). In a miracle of fish preparation, there wasn't a single bone to be found. My choice of a whole grilled sea seabream was stuffed with lemon and herbs, and topped with crunchy samphire, garlic and capers (€18). After I deftly performed some surgery to remove the spine and head, I dove into the lemony, garlicky oil, crisp skin and soft flesh. It bought memories of grilled fish on the beach in Portugal whooshing through my head. On our first visit, we had definitely enjoyed the hospitality offered by Super Miss Sue. Given that it's the latest venture from experienced Dublin restauranteur, John Farrell, it's no surprise that the whole thing has been well thought through. If you don't know who John Farrell is, he's the man behind Dillingers, 777 and the Butcher Grill. So therefore you can reasonably expect that Super Miss Sue will be cool, staffed with stylish people and doesn't take bookings for smaller groups. The current seafood venue is the first phase of the planned development with an upstairs restaurant and gin bar promised. The imagery of Super Miss Sue (featuring a sizzling Rozanna Purcell) is alluring. Miss Sue jumps off the page as a vivacious character in the mode of a bikini-wearing 1950's beach babe. According to her Twitter profile, she has a penchant for deep-sea divers and prosecco. All I'll say is that if a seafood and prosecco diet will garner me that voluptuous figure, then you can count me right in. Good lord those pictures of the food look amazing! Need to try this! Guys, try it the next time you're back in Dublin. I'm sure you'll love it. The Bloody Mary seafood cocktail looks so yummy! I adore seafood!